This DIY barbeque set has everything you need to whip up a variety of awesome sauces. Already master of the grill, he was ready to tackle the sauce itself. This DIY barbeque set has everything you need to whip up savory or spicy tomato-based sauces, piquant mustard-based preparations, and peppery vinegar mop sauce. The easy-to-follow recipes and ingredient packs make creating your own set of sauces a sure-fire success. 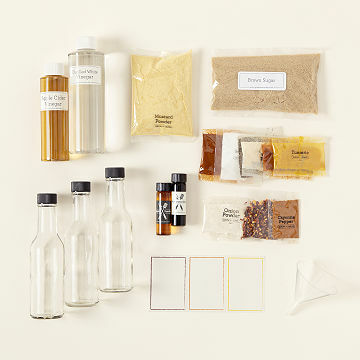 The kit includes three bottles with lids and blank labels to create custom packaging for your concoctions. The kit makes a great gift for dads and creative grillmeisters. Made in Portland, Oregon. Refrigerate BBQ sauce after making and consume within 2 months for best flavor. It's so good. Make it your own. All ingredients provided, please feel free to add anything else you like. The staff are extremely helpful and friendl1y. Had a little trouble with shipping, but they fixed right away. I called them on a Saturday. And received a replacement on Monday right before Christmas! No extra cost. Will be shopping here forever now! I have told everyone about this company. They have the coolest things around! Especially for the people that say I really dont need or want anything? You can find it here. My Brother was happy and excited to try this product out !! He used it on a variety of food from meats to seafood and it was very good! Great for someone who loves DIY! I bought this for a colleague who is a big BBQ fan. He really got a kick out of it when he opened it! Good for developing a new hobby. I would by this again! I haven't used this myself as it was a gift, but my dad raves about how cool this is!